U.S. Crazy 8 prepared another great printable coupon just for you. 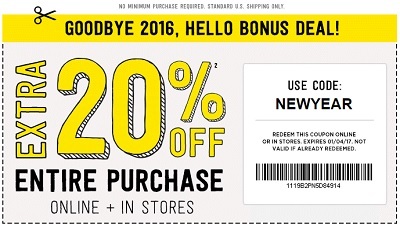 This amazing printable coupon allows you to receive an additional 20% off your entire purchase. To receive the offer in-store use printable coupon. To receive the offer online use online promo code NEWYEAR at checkout. The offer ends tomorrow (01/04/2017). Source of the information is Crazy 8. For more details see any U.S. Crazy 8 store location or U.S. Crazy 8 online.